The FTSE 100 Futures is trading at 7,056.80 with a loss of -0.51% percent or -36.20 point. The CAC 40 Futures is trading at 5,059.50 with a loss of -0.18% percent or -9.00 point The DAX Futures is trading at 11,403.50 with a loss of -0.45% percent or -52.00 point. The EURO Stoxx 50 Futures trading at 3,209.00 with 0.00% percent or 0.00 point. 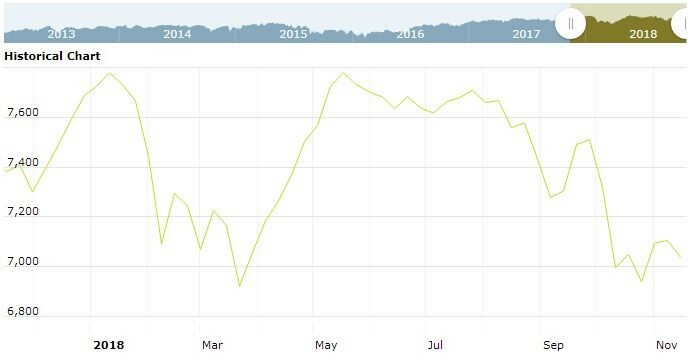 Sterling tumbled 2% against the euro to 1.1265 and 1.9% versus the dollar 1.2750 — suffering its worst drop in more than a year — after Raab and fellow cabinet minister Esther McVey, along with a rash of junior ministers and aides, resigned less than a day after Prime Minister Theresa May’s cabinet “collectively approved” a withdrawal agreement with the European Union. London stocks gave up its earlier gains to finish flat on Thursday as the pound tumbled in the wake of Brexit Secretary Dominic Raab’s resignation, with banks and housebuilders also hit by concerns about the EU divorce process. For the day the FTSE 100 closed at 7,038.01 up with +0.060% percent or +4.22 point. France’s CAC 40 closed at 5,033.62 with a loss of -0.70% percent or -35.23 point. Germany’s DAX closed at 11,353.67 with a loss of -0.52% percent or -58.86 point. In other parts of world, Japan’s Nikkei 225 is trading at 21,680.34 with a loss of -0.57% percent or -123.28 point. Hong Kong’s Hang Seng is trading at 26,093.07 with a loss of -0.039% percent or -10.27 point. China’s Shanghai Composite is trading at 2,679.11 up with +0.41% percent or +10.94 point. India’s BSE Sensex is trading at 35,452.76 up with +0.55% percent or +192.22 point at 12:15 PM.